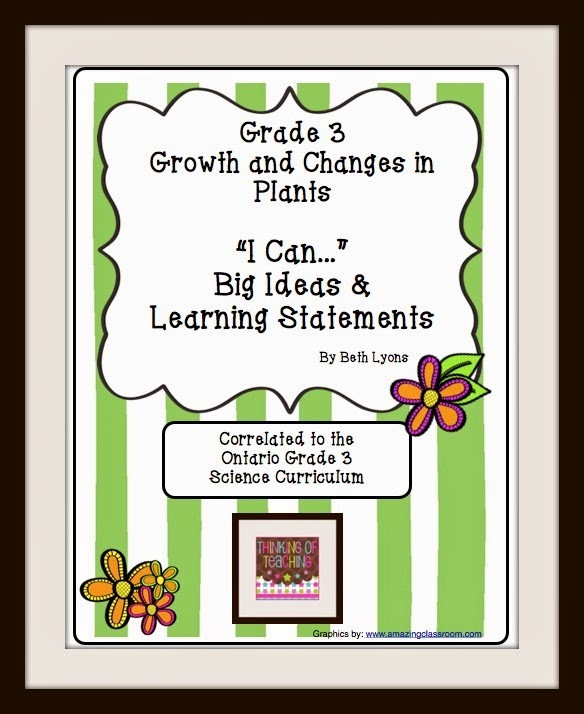 a Class*y Collaboration: Growth and Changes in Plants! And a Sale that Starts Today!! Growth and Changes in Plants! And a Sale that Starts Today!! It's me, Beth, from Thinking of Teaching. I posted my newest product on TPT this week and I'm super excited. I've been blogging for over three years now but only recently opened a store on TPT so every time I upload a product I get a little giddy! This product is correlated to the Ontario Science curriculum but I have a deal for all you non-Ontario teachers! First, my set will be on sale (15% off) from Wednesday, April 9th to 11th this week to celebrate my newest product. 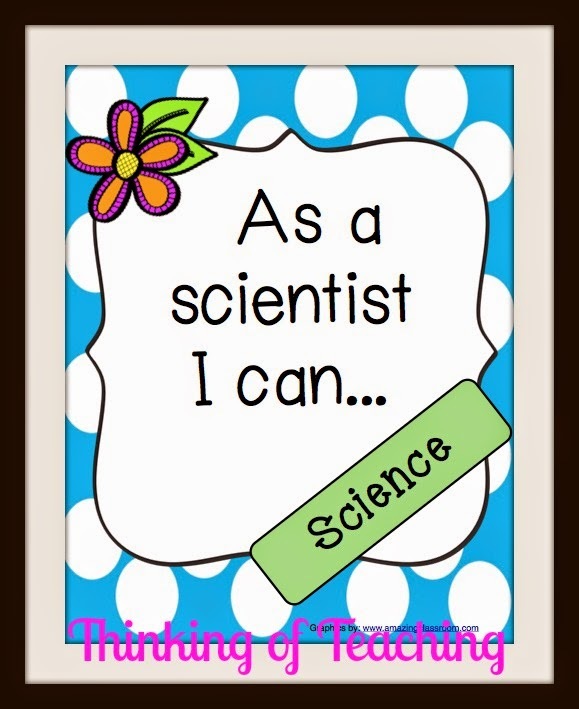 Second, if you want to know if your science curriculum is represented in the learning goal contact me and I'll let you know....but the best part? 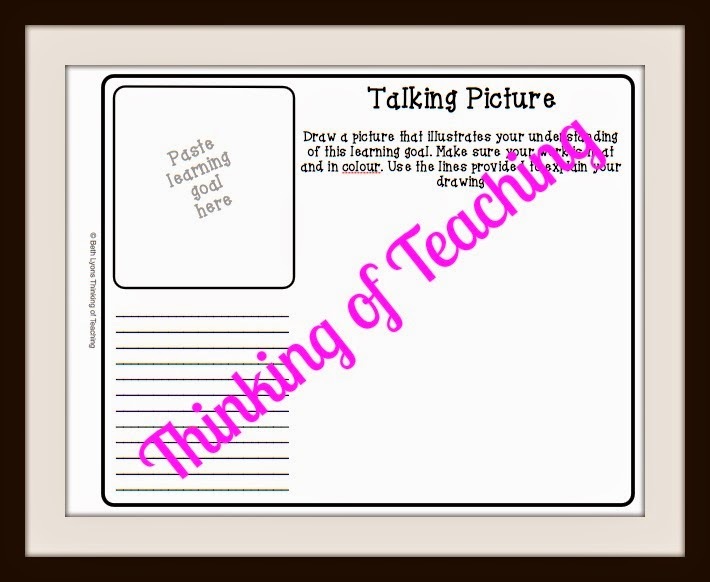 If you would like a certain expectation/learning goal added then I will make you a card free of charge to go along with this set! Click on the image below to see a list of the contents included in this set. 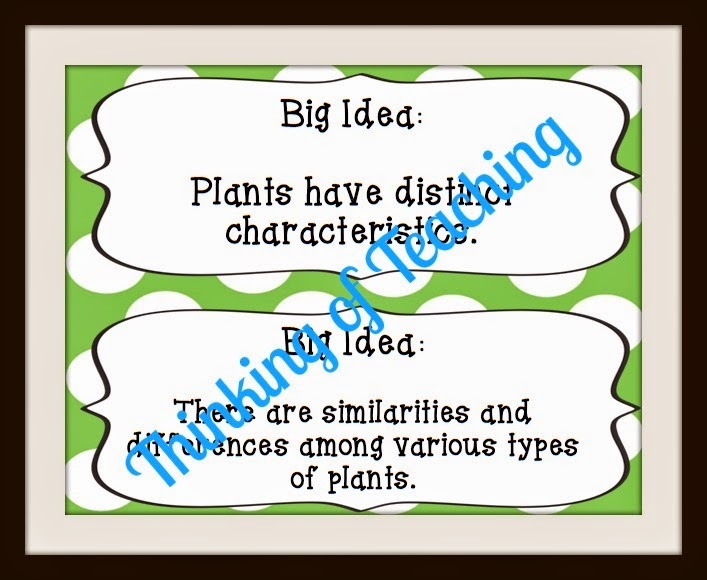 Here is a sample of the Big Idea cards. And the individual Learning Goal cards! You will notice that each card has a Specific Expectation number on the bottom. 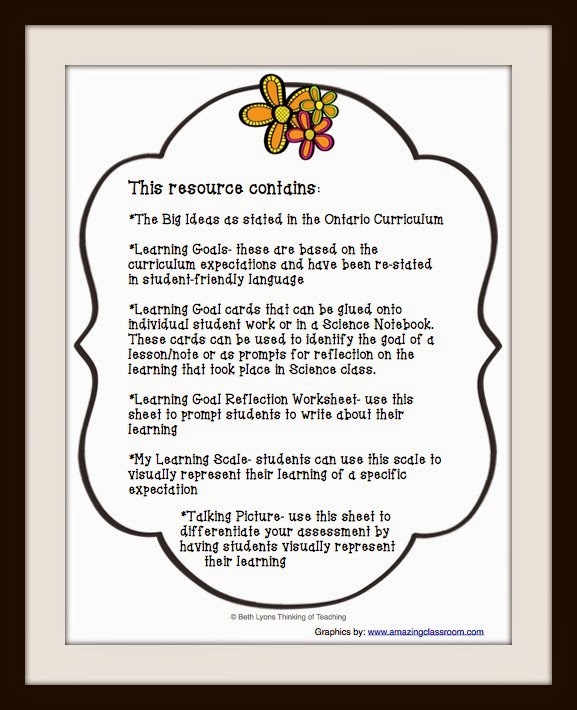 These correspond to the Ontario curriculum and if you are not an Ontario teacher and would like them removed, please contact me and I will start working on a set without the numbers. 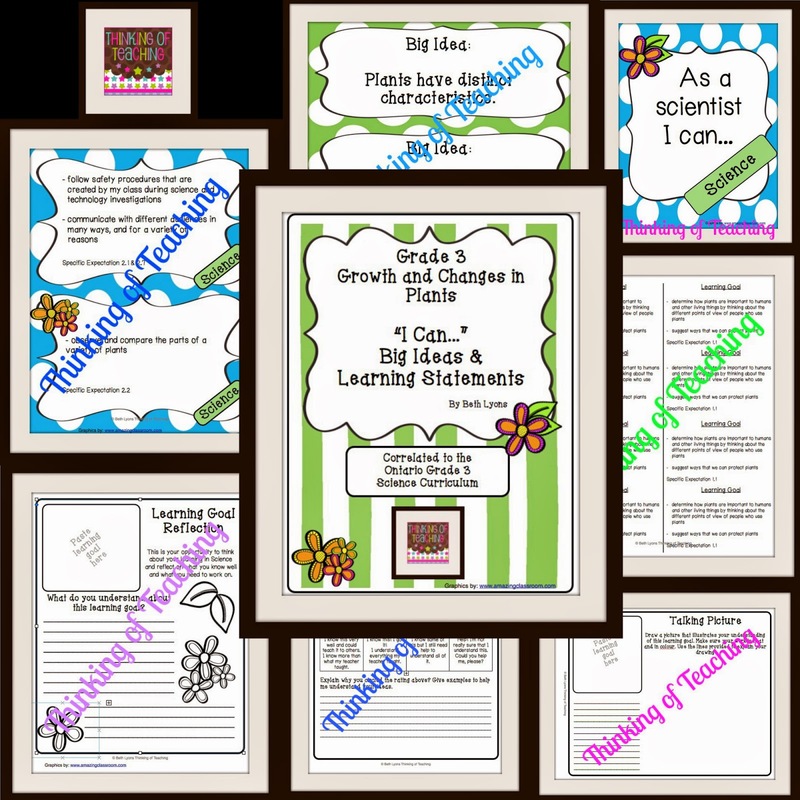 Individual Learning Goal cards that can be glued into your students' notebooks, journals or on assessment tasks and activities. 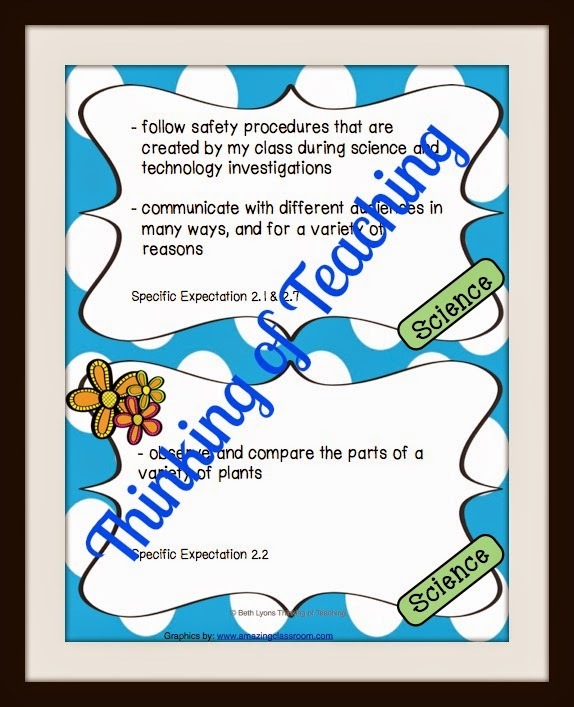 Best of all, I have included three different self-assessment tasks that can be used with this curriculum and the individual Learning Goal cards or with any Science curriculum you may teach! Click on the image below to head to my TPT store to check out this great product and all my others too...remember, I'm new at this so my store is small! And don't forget about the sale, 15% off everything from Wednesday, April 9th (today) to 11th!